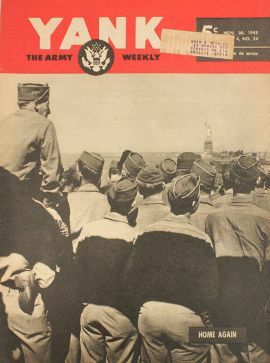 This is one of the first postwar American articles to provide facts, rather than wild speculations, about the Kamikaze Special Attack Corps. A correspondent from Yank, the Army weekly magazine, interviewed a Navy kamikaze pilot named Norio Okamoto who had flown a seaplane on a suicide mission. However, his plane developed engine problems in route to Okinawa, and he got stranded on a small island until after the war's end. Interestingly, the Yank correspondent attributes the many myths about the Kamikaze Corps to the Japanese media, but he does not provide any evidence or examples of Japanese newspaper articles or radio programs that portrayed geisha girls, ceremonial robes, and big funerals for kamikaze pilots. In all likelihood these tales, which had no basis in reality, came from Allied military personnel rather than the Japanese media. Norio Okamoto explained to the American correspondent that the kamikaze stories were "complete fabrications." An interview with a Jap suicide flier who missed his hero's end reveals that the dope on how the Kamikaze Corps lived seems to have been just official hokum. Tokyo—The kamikaze pilot sat with his mouth open and his eyes wide in bewilderment. He tossed off a shot of hot sake and rubbed his forehead. "Where did you get all that stuff?" he asked. "Geishas and banquets and big funerals—maybe I've been missing out on something, but this is the first I ever heard of anything like that." The boy's name is Norio Okamoto. He is 23 years old and much better looking than the average Japanese, with a Weissmuller haircut, white, even teeth and clean complexion. He lives with his parents at Fujisawa, within commuting distance of Tokyo, and it is difficult to picture him setting out on a suicide mission, determined to splatter himself and his plane on a transport packed with American troops. This is exactly what he tried to do, but—according to his story—with none of the preliminary fanfare that had been advertised by the Japanese propagandists. These propagandists, for some obtuse, Oriental reason, about the time of the Leyte invasion began filling the airwaves with dazzling stories about a new Special Attack Corps called Kamikaze—the Divine Wind. According to the Japanese radio, the budding kamikaze pilot was given a super-furlough, provided with enough women to make up for the years he indubitably was going to miss, given a public funeral that would satisfy the most finicky of his ancestors and then dressed in magnificent ceremonial robes for the take-off—as thousands cheered . The rest was not so pretty, but the Japanese described it as one glorious bust, with the pilot sacrificing his life in a purifying plane that would sink an enemy ship and save the nation. If Okamoto's story is true of all kamikazes, just what impelled the Japanese to put out the propaganda tales, which were given general credence in Japan and the rest of the world—especially among American troops who had to deal with this new and outlandish threat—should baffle even the experts in Oriental psychology. One possible explanation is that the stories would mollify bereaved Jap families. Another is that somehow this build-up would scare the soft Americans. A third and also likely theory credits simple insanity. Okamoto's story took all the wind—the Divine Wind—out of the kamikaze's sails. Even the interpreter, a Japanese civilian, was surprised. He had worked for Radio Tokyo and, while he knew a lot of the propaganda stories were ridiculous, he had believed the kamikaze legend. The boy's parents and a Japanese professor listened raptly. It is likely they were hearing the story for the first time. "Here is what really happened—at least to me and to all the kamikazes I knew or ever heard about," Okamoto began. "Early one morning, just before the Okinawa landing, we got our orders to crash-dive into some American transports that had just been sighted off the Ryukyus. Eight of us took off at the same time. They gave me an old seaplane with a top speed of 120 knots, strapped a 250-kilo bomb in the single pontoon, gave me just enough gas to get there, and off we went . "They did give us a little ceremony, but it was nothing unusual at all. Just before we took off the group commander gave us all a parting drink of whisky—just a drink—and wished us well. He stood at a little table with a white cloth on it and toasted us. I was the last man to get the bottle, and when it came my turn to shake hands with the commander I stuck the bottle in my pocket. I forgot all about having it. The ground crews were all lined up as we took off, but they always did that for any combat mission. We left late in the afternoon . When I got about halfway to Okinawa the propeller just stopped turning. It was a moonlight night, and I looked for a place to land and there wasn't any so I set the plane down in the water. I got out of the plane with the navigator—a seaman first class—before the waves swamped the plane. We paddled off in our life jackets. Drawing included with Yank magazine story. "The navigator had been shaken up by the crash and was pretty sick. I gave him a couple of the chocolate bars I happened to have, and he asked for water. I thought about the whisky and offered him a drink of it, but even the smell made him sick. We tried to stay together but a squall came up and he was washed away. "I imagine the sharks got him. I found out about the sharks later—if I had known those waters were full of them I would have been too scared even to swim. "I was in the water about 17 hours and two or three times I got very sleepy—I even heard voices talking to me. Finally I was washed up on a very small island—the name is Suwa Se , and it is too small to be on most maps. The population is only 60, and they were amazed to see me come up from the water. That is when I first heard about the sharks and that is why the people were so surprised. "I had quite a time on this island. The people had some strange ideas. They had heard about radar, and somebody got the idea that any noise at all would be picked up so they went about talking in whispers. When the chicken crowed they believed airplanes could hear it from miles away and the place would surely be bombed. So they killed the chickens. I had plenty of chicken to eat. "But the best one was the cow. This cow got to mooing and people decided mooing could be heard by the submarines—how I can't imagine. Anyhow we had steak—and it was the only cow on the island. "American rations from sunken ships began to wash up onto the beach, but the natives were scared to death of them—booby traps. I had my pick of the stuff. I could read labels, and you fellows certainly had fine rations." Okamoto was stranded on the island until after the war was over. His family, in due course and without any formality at all, had received a mimeographed form stating that their son was dead, having plunged his airplane into an enemy ship. So when he walked in his home there was considerable rejoicing. He got sake and banquets. His mother remarked, "We have a new baby at the house." And then a little later, "This child drinks and smokes at the very start." When the kamikaze had finished the story, we went back over the details of the take-off to be sure he hadn't overlooked something that might bear out a little of the propaganda. Not only were the propaganda stories themselves complete fabrications—"fabulous" was the word Okamoto used—but the force had no special insignia and suicide flyers had no markings at all to distinguish them from other pilots, he said. They got no preferential treatment at all, and Okamoto said some of the younger men griped about this because they said they thought they ought to be given better treatment. As a matter of fact, Okamoto said a kamikaze was told by his superiors exactly what he should do. He had to listen to pep-talks about the harsh, Spartan existence of the legendary Japanese soldiers—the Samurai way. Kamikaze barracks were just the same as any other, and so were the kamikaze crews. The fields they took off from were the same fields everybody else used. They felt a certain esprit de corps, but they also felt at times that their superiors were goofing off while they were dying. I tried to get out of him just how he felt as an enemy, to get him to tell how hard he tried to kill us, and this caused him some embarrassment. But he tried earnestly to explain. In the first place, he said, he was a soldier of Japan (as a matter of fact he was a Navy pilot) and as such he was taught to abandon any thought of coming home alive. He was trained to erase all home ties and think only of selling his life as dearly as possible—for the Emperor. Okamoto said he had actually felt a sort of relief when he joined the kamikazes. He had nothing else to worry about, and he had a job to do. He said there was some friction between pilots and their superiors because pilots thought their lives were being wasted on trivial objectives. They like to think in terms of blasting carriers or battleships—no small-fry craft. Also, kamikazes felt within themselves intimations of disaster—not personal, that was a foregone conclusion—but for the nation. 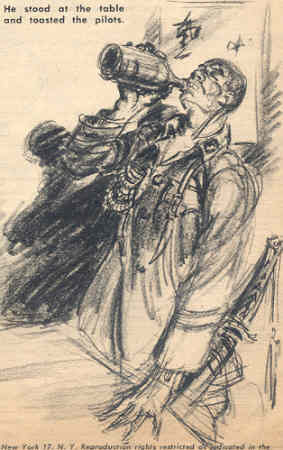 They realized that organization of the suicide corps was a measure of desperation, but they hoped that by some miracle the country would win the war. Okamoto had the same urge for action that in America prompted our soldiers to clamor for overseas assignments or, once overseas, a dangerous mission. That was another reason for his wanting to be a kamikaze—so he could get in a plane and go do something. Planes were so scarce that only suicide pilots could get one. An inexperienced pilot didn't have a chance to fly any more unless he became a kamikaze. Thus most of these men were without combat experience. There was another thing, too. Okamoto's younger and only brother—also a pilot but not a kamikaze—lost his life in the war. He flew out in a patrol mission over Formosa and he didn't come back. Okamoto resolved to avenge his brother when he asked to be relieved of his duties as an instructor and be given a kamikaze assignment. He did not write his family about this decision or try in any way to notify them. When his number came up he was allowed to write a farewell letter to be delivered post mortem. I asked him what he had written in the letter, and he tried to wave aside the question. Finally he insisted that he had forgotten. His mother—obviously bursting with pride for her surviving son—began to speak in Japanese. The interpreter followed her words, translating one sentence at a time. It was the letter, and it went like this: "My dear father and mother: Finally I have been honored with the opportunity of body-smashing [literal translation] my plane into the enemy for the good of my Emperor and my country and my family. I may not have been a very good son, but I hope I may redeem myself in this one and only mission. May good health be with you and with the family." The mother had memorized it word for word. There was an awkward silence when she finished. Her husband, an elderly man whose face is paralyzed, looked at her soberly and then at his son. The boy leaned over the eight-inch high table about which we sat and took a cigarette. He lit it and stared into the garden outside, which was flooded with sunshine. The Japanese professor—a friend of the family—broke the spell by flourishing a bottle of scotch. Everyone seemed relieved. The mother got up and left the room. She came back a little later with some rice savories. There were already lots of rice savories on the table. After a couple of scotches, the boy waved his hand and laughed. "I want to forget this kamikaze stuff. The war's over, and I am glad that if Japan had to lose, it was the Americans who came in. The first American I saw was an MP, and I was scared to death of him. I thought he'd be looking for me because I was expecting all kamikaze pilots to be shot. But later I saw soldiers laughing with children and giving out candy, and I felt better. And then I heard about American soldiers who made some Japanese men stand up in a train and give a mother and her baby a seat. That made a big impression on most of us here in Japan—more of an impression than you can imagine. "I feel like I have been born again. I want to strike out for myself. I could go in with my father [an agent for Coty perfumes and other drugstore goods] but I think I'd like to import sporting goods stock. "I'm a lot luckier than most kamikazes. I got out alive. Not one of us in the outfit went in for flag waving or that glory stuff, but I was perfectly willing to die—believe me. Now, of course, I'm glad to be alive. So I feel lucky." Just why he was once so very willing to die, however, the former kamikaze pilot did not—or would not—explain. And the Japanese mind remains a mystery. 1. Japanese newspapers and radio had many stories about the Special Attack Corps, but the activities described in this sentence such as a kamikaze pilot dressed in a magnificent ceremonial robe for take-off were not part of the stories in the Japanese media. 3. No kamikaze squadron of seaplanes took off "late in the afternoon" as described by Norio Okamoto. They took off in either the early morning or at night (Osuo 2005, 237-40). 4. Suwa Se, usually written as Suwanosejima or Suwanose Island, is about 8 km long and has one of the most active volcanoes in Japan. It is located about 120 km north of Amami Oshima and 200 km south-southwest from Ibusuki at the southern tip of Kagoshima Prefecture from where Norio Okamoto most likely took off in his seaplane.